AUDUSD is facing a resistance of the top trend line of the price channel on its 4-hour chart. 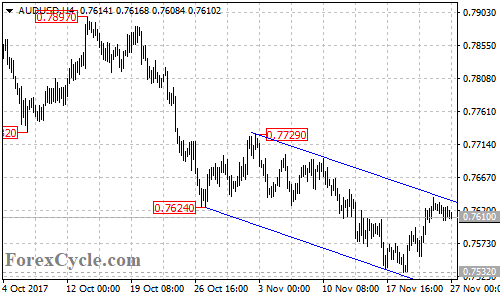 As long as the channel resistance holds, the bounce from 0.7532 could be treated as consolidation of the downtrend from 0.7897, and a breakdown below 0.7532 support could trigger another fall towards 0.7450. On the upside, a clear break above the channel resistance will indicate that the downtrend had completed at 0.7532 already, then further rise towards 0.7729 could be seen.